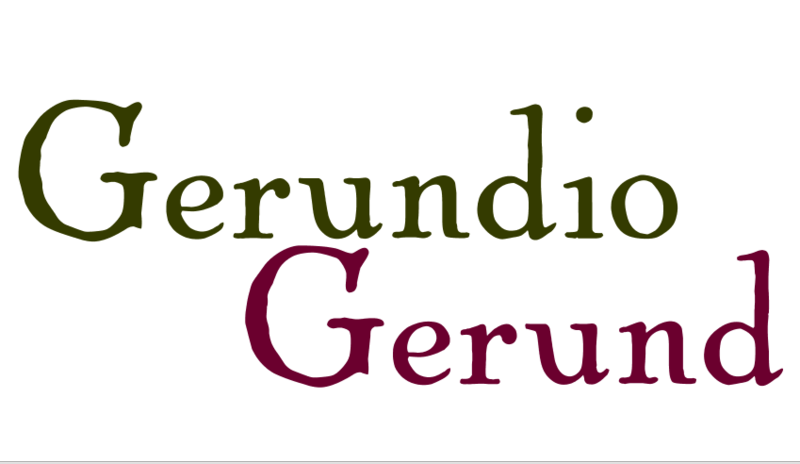 The gerund (gerundio) is a grammatical form that refers to actions in progress. In English, we form gerunds with -ing: joking, laughing, dancing, playing. In Spanish, however, we form them differently. Starting from the infinitive, we remove the last two letters. If these letters are -ar, we add -ando. If these letters are -er or -ir, we add -iendo. Hablando (hablar), comiendo (comer), viviendo (vivir). In English, we use the gerund as a noun: Running is good for your health. In Spanish, we can’t do this, and if we want to make a noun from a verb, we have to use an infinitive: Correr es bueno para la salud. Since gerunds refer to actions in progress, they can’t be used alone. Instead, they need to occur with another verb. Most often, this verb is estar, but they can also be used with seguir, continuar, ir,venir, and andar. The differences between these helping verbs are subtle, so a few examples will (hopefully) help explain. This is the most ordinary usage. Seguir and continuar have the same exact meaning when followed by a gerund: something is still happening, continues to happen, or keeps on happening. He’s (still) saying (the same) stupid nonsense. Venir, like ir, often implies physical movement, although towards the speaker. When venir is used with a gerund in a figurative sense, it typically implies that something has been going on a long time, and perhaps even frustration that it has not changed. Given all of this new information, I have a question for you: ¿estás aprendiendo español? y ¿vas progresando?